Not long ago, asteroid impacts weren’t considered as a significant factor in the evolution of Earth. Following the Late Heavy Bombardment, which pummelled the inner solar system around 3.8 billion to 3.9 billion years ago, asteroid impacts were generally regarded as minor events. All this changed in the late 1970s, when Walter and Louis Alvarez discovered the 65-million-year-old K-T (Cretaceous-Tertiary boundary) asteroid impact event. This is now known to be linked to the extinction of the dinosaurs, among many other species. Thus interest in extra-terrestrial impact research – a discipline bridging astronomy and geology – soared when the spectre of dinosaurs escaping asteroid impact-ignited flames was transformed from science fiction to science fact. Attention has now been drawn to our own shores with the discovery of new impact structures, including two very large asteroid impacts buried more than two kilometres under the surface in northeastern South Australia. If the preliminary evidence is anything to go by, these could represent the largest impact sites on the planet. One can only imagine the catastrophic event that might have caused them, and the consequences it had for life on Earth at the time. To date researchers have identified more than 172 meteorite craters and asteroid impact structures around the world, showing that our planet has never been spared from bombardment by asteroids. Most of the asteroids responsible for these impacts have originated from the asteroid belt between Mars and Jupiter and most of the comets originated from the Oort cloud at the fringe of the solar system. Here in Australia, we are blessed with a truly ancient landscape, some of which is up to 3.7 billion years old and contains minerals up to 4.4 billion years old. We also have as high degree of geological stability, meaning many of the impact structures have been preserved over the ages. 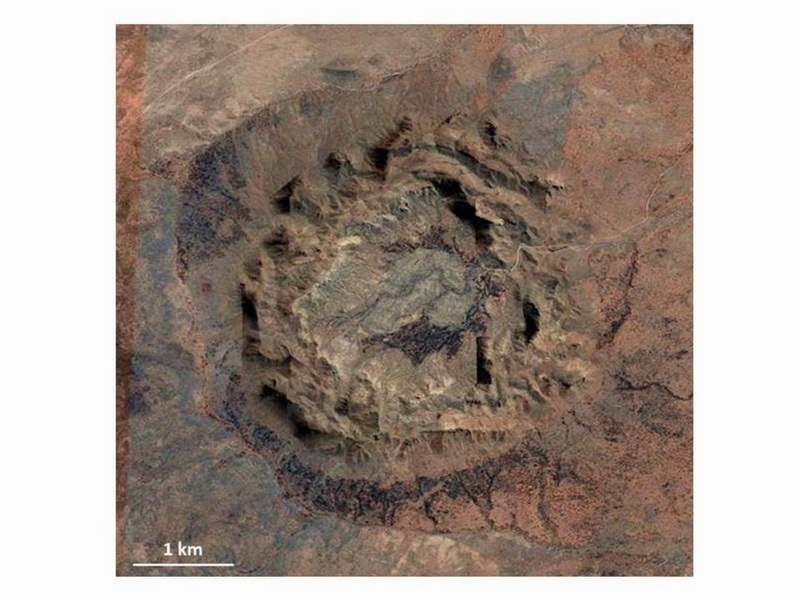 To date, a total of 33 impact craters and 27 probable-to-likely impact structures have been found in Australia, ranging from small crater clusters such as Henbury, Northern Territory, to large impact structures such as Acraman in South Australia and Woodleigh in Western Australia. Some of these are well exposed, such as Gosses Bluff, Northern Territory, Spider in the Kimberley and Lawn Hill in Queensland. Others are buried by younger sediments, such as Woodleigh, Western Australia, Yallalie in Western Australia and Tookoonooka and Talundilly in southwest Queensland. But the largest of them all may have been uncovered under the red expanse of central Australia. 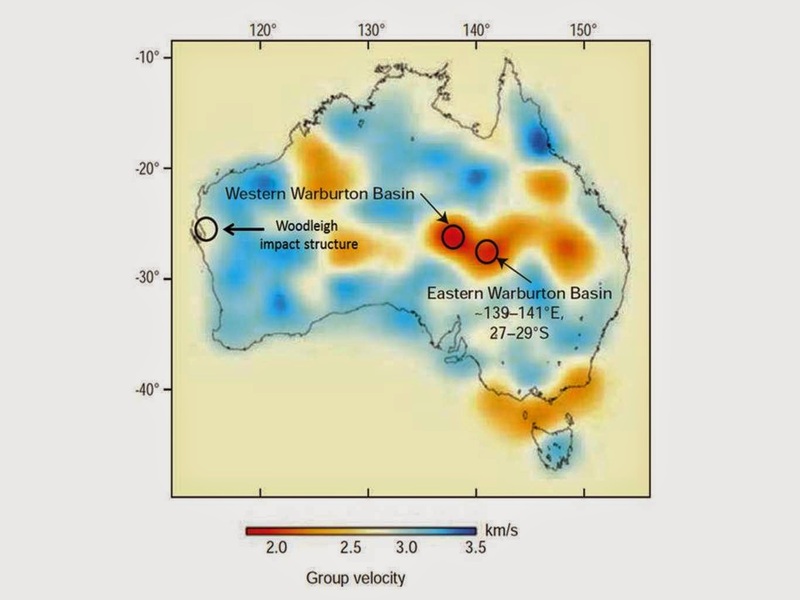 The first hint at shock metamorphism of the Earth crust in north eastern South Australia was discovered when Tonguc Uysal at the University of Queensland’s Geothermal Energy Centre of Excellence was involved in drilling for geothermal energy in 2009 in the oil and gas rich Cooper Basin, which overlies the Warburton Basin. While there, he came across telltale evidence of unusual micro-structures within quartz grains from the local granites. He recognised the quartz structures were similar to those that I and my colleagues found in 1999 in the 120 kilometre large impact structure at Woodleigh in Western Australia. I was intrigued by Tonguc’s findings, and he subsequently offered me the opportunity to analyse the drill core samples myself. Starting in 2010 I spent many months studying drill core samples from the Warburton Basin, using three-dimensional optical microscopy and scanning electron microscopy. This was followed by detailed transmission electron microscopy undertaken by John Fitzgerald. We found that the quartz lamella displayed the characteristic deformation pattern which can only be produced by extreme shock pressures above 10 gigapascals (100 kilobars). To put this in perspective, these levels are much greater than the pressures at the base of the continental crust 30km to 50km beneath the Earth’s surface. Analysis of the Warburton samples suggested shock pressures of between 10 and 20 gigapascals, which can only be produced by an impact by a large asteroid or a comet. While we were performing our analyses, seismic researchers Brian Kennett and Erdinc Saygin and their colleagues at the Australian National University published a paper reporting very large seismic anomalies in north-eastern South Australia. These anomalies coincide with the region where we found shock features in quartz crystals. The seismic evidence may be related to deep fracturing of the crust and to an increased geothermal gradient, where the temperature increases more rapidly with depth than in other regions of the Australian continent. This observation was consistent with geophysical modelling of airborne magnetic and gravity data which indicate anomalies under the Cooper Basin, studied by Tony Meixner of Geoscience Australia. Using the geophysical anomalies along with the distribution of shocked quartz grains found in drill holes, we estimate the combined size of the twin structures at approximately 400 km. This would make the Warburton twin structures the largest known to date. However, we are yet to pinpoint the age and the consequences of the Warburton twin impacts. What we do know is the impact must be at least 300 million years old or older. This is based on study of the ages of bodies of granite affected by the impact, which are overlain by younger sediments that show no signs of shock. Other studies of the cores of zircons in the granite by Tonguc Uysal and Alexander Middleton and their students at the University of Queensland suggest the zircons contain signatures of both a 300 million years old impact and a 420 million years old impact. If we can resolve the age question, that will allow us to search for fallout ejected from the original crater and related tsunami events, and potentially figure out whether the impacts are related to an extinction event. The geological record contains a number of extinction events that were associated with impacts by asteroids, such as the 580 million years old Acraman impact event and the 66 million years old Cretaceous–Paleogene event that killed off the dinosaurs. The most significant mass extinction event, though, is the massive Permian-Triassic extinction which killed off 90% of species alive around 250 million years ago. This was a period of intense volcanic activity and also coincides with the Araguainha impact located in Brazil. The discovery of the Warburton twin impacts constitutes a milestone in the study of the impact history of Earth, including research of impact events associated with 2.5 billion to 3.5 billion years old formations in the Pilbara Craton in Western Australia. The more we know about these impacts, the better we can understand other phenomena, such as mass extinctions, the formation of certain geological structures over time and related magmatic events. It also paints a vivid picture of what might have happened on that fateful day a few hundred million years ago, and the catastrophe it must have wrought.